The Fake news epidemic has finally caused Facebook to take action. The company will now explicitly warn people before they share articles that might contain disputed facts. Users in some parts of the world observed that Facebook was acting oddly when they tried to share an article on the Irish slave trade by a site called The Newport Buzz. Titled “The Irish Slave Trade, The Slaves That Time Forget,” the article talked about how the Irish were transported as slaves by the British in the 1600s. But if users tried to share this article on Facebook, a message popped up. “Disupted by Multiple, Independent Fact-Checkers,” Facebook admonished. 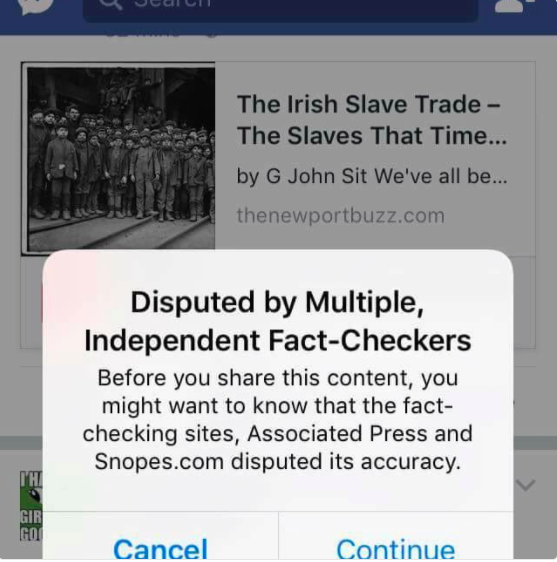 “Before you share this content, you might want to know that the fact-checking sites, Associated Press and Snopes.com disputed its accuracy.” Users are then given a choice to either cancel the share, or to continue. Facebook does let you post if you choose to continue, but adds a red warning sign to the post, saying that the article is disputed by the two sites. This move marks a departure from Facebook’s long-held policy of not adjudicating on the truth. “This is an area where I believe we must proceed very carefully though. Identifying the “truth” is complicated…I am confident we can find ways for our community to tell us what content is most meaningful, but I believe we must be extremely cautious about becoming arbiters of truth ourselves,” CEO Mark Zuckerberg said in November last year, days after Donald Trump had won the American Presidential election in a stunning upset. Several sources had then blamed the rise of “fake news” for Trump’s victory, saying that right-wing sites deliberately wrote false articles which painted Trump in good light. Indeed, several hoaxes had spread during the campaign, such as the news that the Pope had supported Donald Trump. Trump supporters had hit back, claiming that left-leaning site had published hoaxes of their own, including spreading a rumour that Trump had once said that he’d run as a Republican because Republicans were stupid and would vote for him. Facebook, though, has chosen to tell its audience what might be fake news, but there are early indications that this might be a slippery slope to go down. There has been an immediate backlash to the Irish Slave article being flagged as fake news, with several accounts, many of them Irish, claiming that Facebook was peddling only its version of the truth. Turns out their are people who deny an Irish slave trade. Transporting people against their will and forcing them to work for free is . . . Indeed, Wikipedia has an article titled “The Irish slaves myth”, but it illustrates the ambiguity around the topic. “The majority of these entered into indentured servitude in the Americas for a set number of years willingly in order to pay their way across the Atlantic, but at least 10,000 were transported as punishment for rebellion or other crimes, then subjected to forced labour for a given period,” it notes. It’s a thin line between being put into forced labour and slavery, and for Facebook to take a stand firmly on one side will likely court controversy. The fake news checker feature, though, doesn’t seem to be live in India yet. It might take a while to get here, given that India has few independent fact checking sites that Facebook can rely on. But India’s no stranger to the fake news phenomenon – upon the release of the Rs. 2000 note, wild rumours about it containing chips and satellite receivers had gone viral, and even picked up by some mainstream media outlets. India’s left and right wing sites, much like the US, also regularly trade accusations of distorting the truth and forwarding their own agenda. But Facebook has shown that it’s willing to take a stand on the thorny issue. This will likely please Silicon Valley, which strongly votes Democrat, and has expressed anguish at how their platform was used by the right to help put Trump into the White House. It also shows that Facebook is willing to take a moral stand over clicks and shares – Facebook only stands to lose revenue by clipping potentially viral, but fake, articles in the bud. Facebook’s gone down a difficult path, but if the backlash on the Irish slave trade is anything to go by, it might have a bit of a hot potato on its hands.